Falling For YA: I made a book tree and so can you! 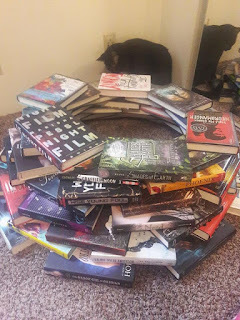 I made a book tree and so can you! As you may already know I recently moved from Tacoma, Washington to Boise, Idaho for a new job as a law librarian! I absolutely love my new job (and plan on doing a post about it). The only downside of moving is that I lost almost all of my shelf space and most of my books are still packed. Not seeing the covers, and being able to have ready access to my packed books, really bummed me out. 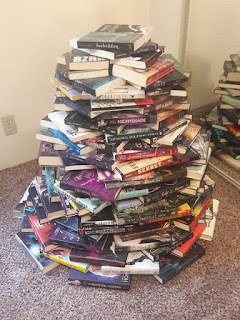 So, since it is the holiday season I decided to try making a book tree with all of my packed books. Yes, it's that simple. 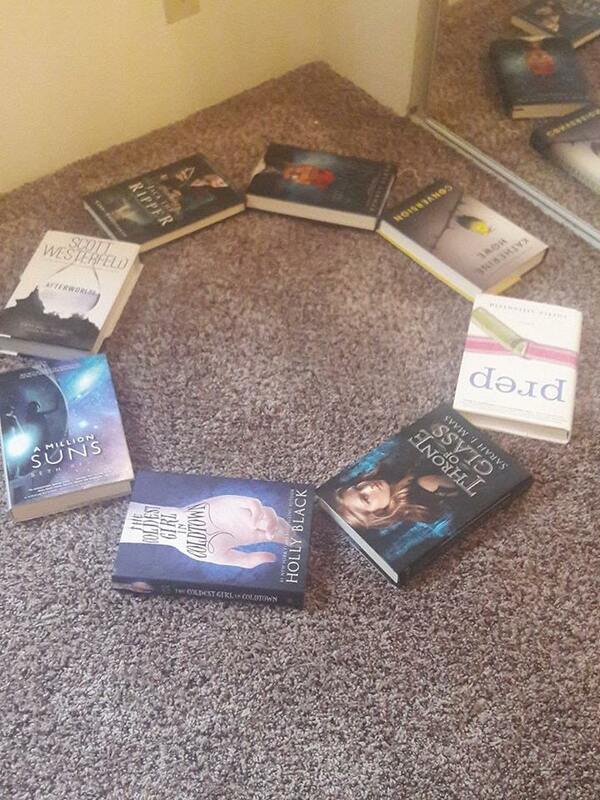 I made sure that all of the books touched corners so that my base would be sturdy. I also used hardback books here rather than paperbacks for this section. Make sure to keep the edges of your books touching and progress inwardly with each row of books you add so that it gives the "tree" effect. Bonus: My cat Marco wanted in on the action. Step 3: Add something for structure/sturdiness. 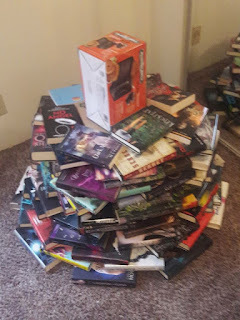 I'm not builder but I could definitely tell by 7 rows in that my book tree wasn't going to be structurally sound. So I grabbed a box, put it in the middle and kept building around it. 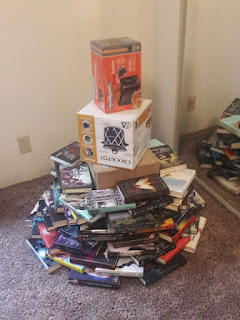 I originally planned on making my book tree as high as a moving box, crock pot box, and toaster box...but that was a little too tall. I could already tell it wasn't going to turn out well after only a few rows so I decided to just go with the moving box/toaster box combination. I know, very scientific measurements. 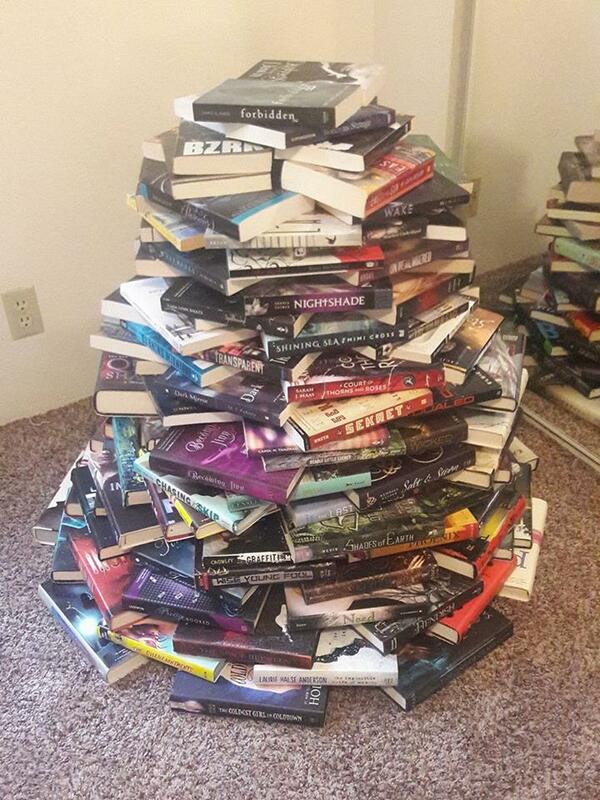 It was also at this point that I switched from hardbacks to paperbacks to fill in my tree. 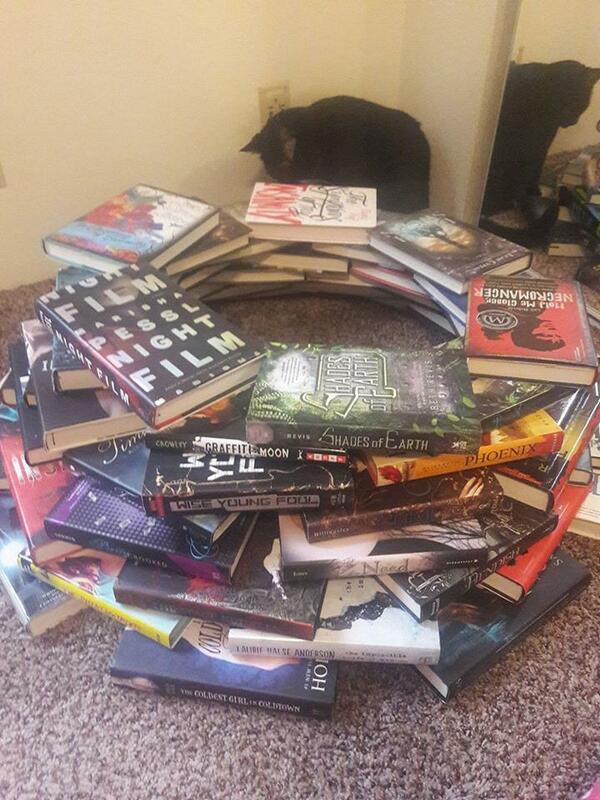 Step 5: Fill in with rows of books until desired height. 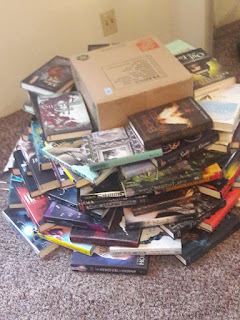 The last couple rows are just stacks of two books each. I added a Hello Kitty bank that I had on a shelf and Christmas lights I got at an after Christmas sale last year. It all came together really nicely though. 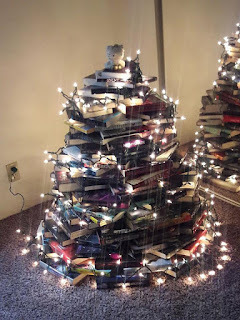 I'm in love with my first ever book tree! 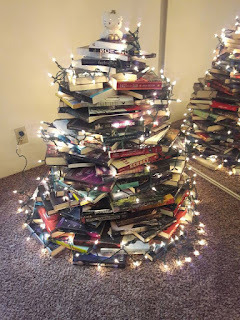 Ooooh that's a really cute and creative idea!